The USPSTF has composed a draft statement recommending that idiopathic scoliosis screening (routine screening to look for scoliosis) be discontinued for children 10-18 years. This draft has been published solely for the purpose of receiving public input. That’s us. So let’s begin. Important: this draft statement is open to public input through June 26, 2017, 8pm ET. 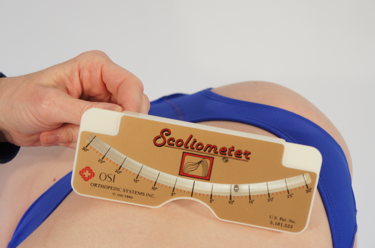 This tool is a scoliometer. It is commonly used in routine scoliosis screening to identify children who have idiopathic scoliosis–or scoliosis with no known cause. It is a test that is inexpensive and free of harmful side-effects. “This report describes the first large population-based study with a long-term follow-up indicating that a scoliosis screening program can have sustained clinical effectiveness in identifying patients with adolescent idiopathic scoliosis needing clinical observation. As the prevalence of adolescent idiopathic scoliosis increases, scoliosis screening should be continued as a routine health service in schools or by general practitioners if there is no scoliosis screening policy.”–Fong Dy, Cheung KM, Wong YW, Wan YY, Lee CF Lam TP, Cheng JC, Ng BK, Luk KD. Karena: Strongly agree. These initial screenings are not radiographs and therefore there is no harmful radiation associated with these tests. #21: Physiotherapeutic Specific Exercises are recommended as the first step to treat idiopathic scoliosis to prevent/limit progression of the deformity and bracing. Karena: Strongly Disagree. Here is a link to a commonly used pediatric pain screening tool. In my experience, just using the word pain with a child puts us at a disadvantage of learning what is really going on with a child. In my experience, if I ask a child on their first visit if they have pain, they almost always say, “no.” But it almost always turns out to be a false “no.” They have no other experience than the experience they have with their spine and nothing to compare it to. In other words, they don’t know if they are in pain or not. Here are a couple of anecdotes for you from three children I have worked with recently. Karena: But you told me when you first came in that you don’t have any pain. Ashlyn: Well, I don’t. It just gets tight and aches. It feels tired. Travis: I worked with Travis for about 14 hours total before I discovered his story. Travis is the star soccer player on his team. He came in for a session one day after a game. Karena: Hey Travis! How’d the game go? Karena: Cool! You must have played the whole game then? Travis: No, only about half. Karena: Your team was doing so well that they didn’t need you? Travis: No, sometimes my back stiffens and I just don’t feel like I can breathe. Karena: So what’s happening with the school trip to DC? Olivia: Uhhh, not a lot. I’m not going. Olivia: They won’t let my mom go. So I’m not going. Karena: But there will be other parents, right? Olivia: Well, yeah, but my mom knows how to adjust my brace. Olivia: And I can’t walk that far–I get too stiff. And I’ll need my mom to go back to the hotel room with me. The other parents will have to stay with the group. Do you ever find yourself not doing something that your friends are doing? (field trips, dance classes, water parks, sports) Why? Do you play sports? If not, Why? What’s your favorite sport? Why? Is there anything you wish you could do better in your sport? 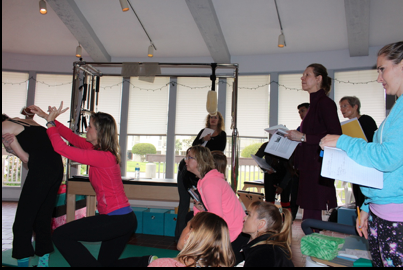 In this photo, Karena is teaching professionals to use the scolio-meter. Scoliosis screening tools and methods are not complex. Positive results can be confirmed by a medical doctor who will help a patient and family decide on the best course of treatment. Leaving a comment for the USPSTF on their draft statement. Feel free to copy and paste my comments from below! Karena’s Response: I would expect a more thorough review of available evidence. The draft cites 30 studies. The recent recommendations from SOSORT: Society of Spinal Orthopaedic and Rehabilitation Treatment cites 380 studies. For example, the draft cites two studies on the effectiveness of exercise for idiopathic adolescent scoliosis where the SOSORT studies cites 41 and makes 8 recommendations on the effectiveness of using exercise in treating idiopathic scoliosis.